I had first mentioned my love for dim sum here, with the familiarity of the most popular dishes lending a comfort-food type of appeal. Never mind the fact that while you’re stuffed when you walked out the door, you’ve still got room for dessert and are hungry 3 hours later. Like I said, never mind that. The next stop on my quest for the best dim sum joint was Golden Unicorn. Despite the fact that the logo on the napkins and plates aren’t actually a unicorn (is it a griffon? Mythology fans, help me out here), I give the restaurant props for having its own website. Additionally, Golden Unicorn has the unique feature of pictures and English names posted on the pushcarts, meaning you won’t accidentally order chicken feet unless you truly want to. All that is great. But how was the food? Don’t be afraid of the three syllable name, kiddos – any word butchering is worth it for these babies. Putting to use that sweet and savory combination that I love so well, haam sui gau is a deep fried (yeah, baby) rice-flour dumpling that is filled with pork and chopped veggies. The outside is slightly sweet and chewy and when served hot, the combination is superb. Sometimes this dish has been around the block for a few rounds and has gotten stale, but I’m happy to report that Golden Unicorn’s haam sui gau was hot, fresh and crispy. Cherng fun is one of my ultimate comfort foods – when I was little, my grandfather used to order plates of them, along with har gow (coming up in the post), to appease my cousins and me. The beef variety is seasoned with delicate cilantro and garlic, while the minimal ingredients in the shrimp roll would appeal more to purists. 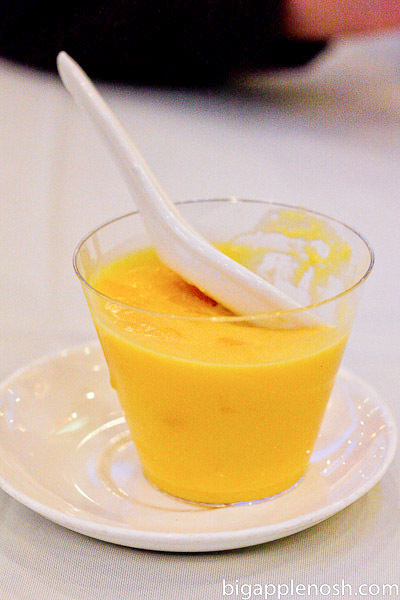 While I’ve found a place in Chinatown that has the very best cherng fun by far (I’m saving that post for another day), Golden Unicorn‘s were pretty satisfying. I next ordered the char siu bow, or roast pork bun (first picture). 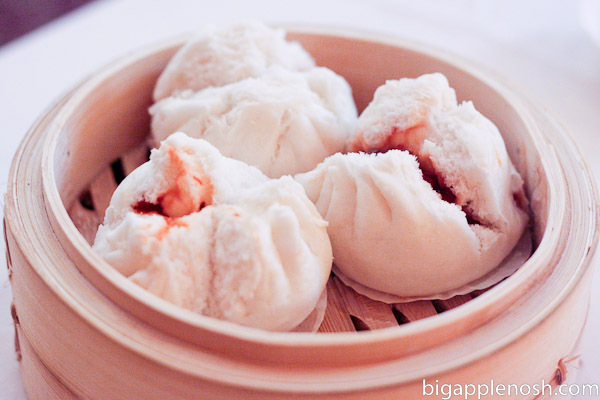 The roast pork bun can be ordered either steamed (jing) or baked (guk). I went with the white fluffy steamed ones – while they were a little on the smaller side, the pork was nicely seasoned and flavorful. Additionally, the bun was fresh, as evidenced by the soft, fluffy dough. 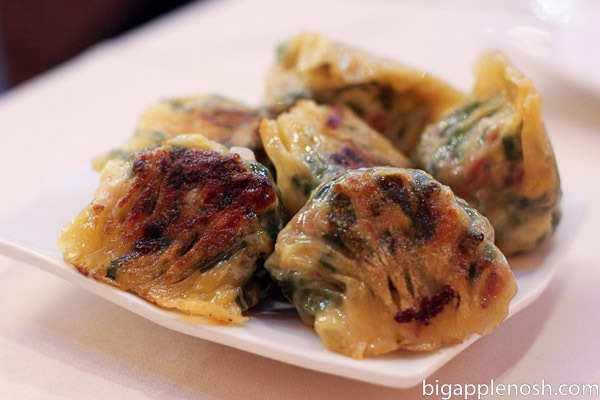 I soldiered on with the gow choy gow – or garlic chive dumpling, mentioned in my previous dim sum post. Golden Unicorn‘s gow was heavy on the filling, just how I like it! 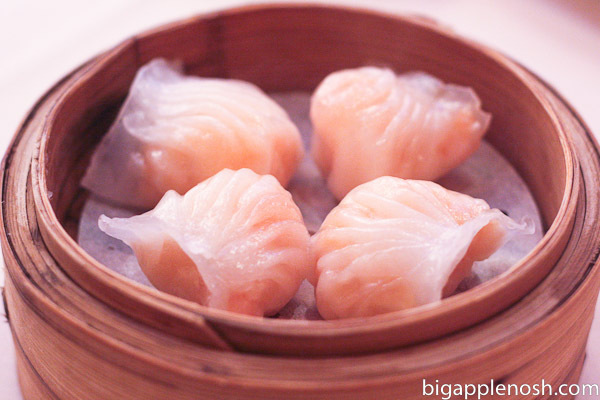 While Golden Unicorn‘s har gow were a tad on the smaller side, the shrimp were flavorful and delicately prepared. I guess good things sometimes do come in smaller packages! 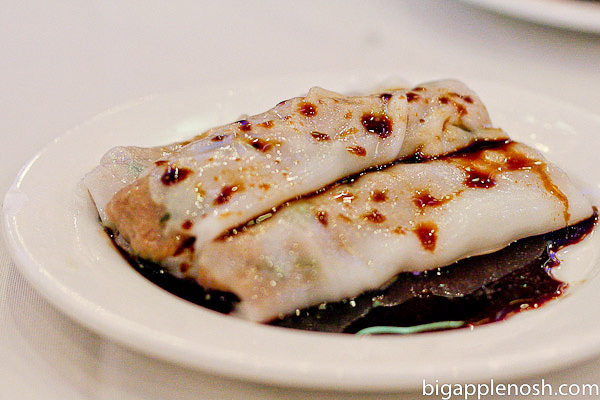 Golden Unicorn is great for both the dim sum novice and expert alike – there is a good variety of staple dim sum dishes as well as more contemporary interpretations. The restaurant is clean and bustling, and the pictures and English names on the sides of the pushcarts make ordering a breeze. 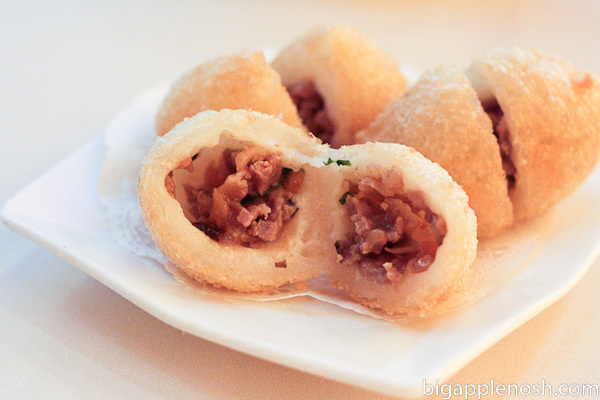 If you’re just whetting your appetite with dim sum, Golden Unicorn is a great start! Dim sum the easy way. What are your go-to comfort foods? Yummy! We're going to dim sum for lunch at work today to welcome a new associate at our firm. I can't wait, and this post has made me even more excited for it! har cherng is one of my favorites. Thanks for phonetically spelling everything. I never knew how the cherng fun's were pronounced. I used to come here as a kid with my grandparents as well. Just about every Satruday we'd go up to meet my grandparents in their apartment in Confucius Plaza and walk to Golden Unicorn. Ahh.. memories! ooh yummy! dim sum is so fun and tasty. you didn't talk about the celebrity customers, though. Oooh we'll have to try this place out when we go back to New York. And what a fun name! the haam sui gao is my favorite too! 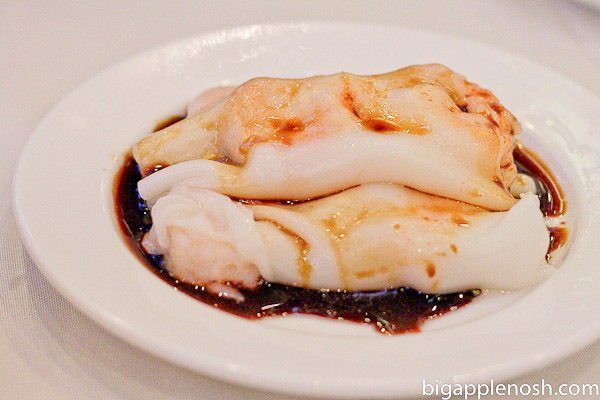 you should definitely try dim sum go go, it looks westernized, but it's actually very good and yummy! this was kind of a special occasion place for us for a long time, but i think i've been only once in the past 8 or 10 years now. now i want to go back. OMG. that looks so good! So it’s six months later but since no one has answered- yes, that thing is a unicorn. It’s a kirin/qilin, often called a Chinese unicorn, looks nothing like the European unicorn. Lots of legends and mythology and stuff about it, I am too lazy to go look them up now, but they were considered to appear during the reigns of good rulers or before the births of great sages and that sort of thing. Generally Auspicious.